E Vernon Plumbing Solutions is a local business based in Leicester. We pride ourselves on a personalised service. J Allen Heatig & Gas Solutions works in Partnership with us. 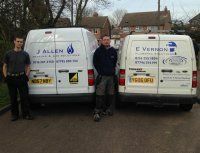 James Allen is Gas Safe Registered and looks after all Gas Installations & Repairs. Please do not hesitate to contact us with any query or question.